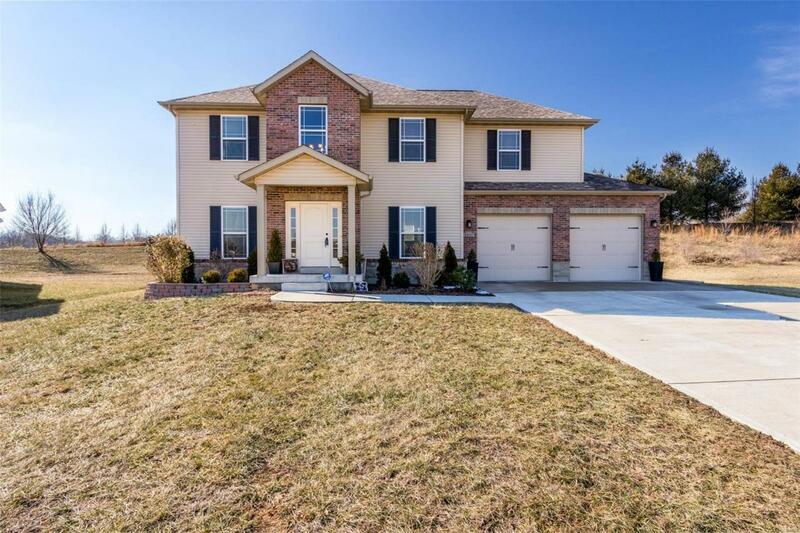 This 2 year old, contemporary 2 story home in the popular, R-7 school district, shows like a display with it's meticulous dcor! Radiating class & charm, the elegant 2 story entrance foyer invites you into the home with beautiful arched windows & tasteful wood floors that lead up the staircase with iron, inset bannisters. The main floor showcases a spacious kitchen with upgrade cabinetry, stainless whirlpool appliances, a big pantry & breakfast bar that seats up to 4. The open floor plan includes a large family room with a gas/stone fireplace, space for a breakfast table and a nice formal dining room & a half bath. Upstairs is the master suite along with 3 other full bedrooms & 2nd full bath. There is a rough in, in the basement for yet another bathroom & an egress window which could be for the 5th bedroom. The 2nd story laundry room includes brand new whirlpool washer/dryer to make your life easier. The 2 car garage is oversized. Recessed lighting & ceiling fans through out the home. Cross Street Address Timber Wolf Dr.